If you are a field of grain, growing in upstate New York, how are you going to get to the distiller who wants to use you in Brooklyn? Cue the heroic efforts of the distributor without whose wings ingredients and food couldn’t easily sail to the shops, restaurants, food buying clubs, and producers that want them. Regional Access gives wings to many food enterprises: livestock farmers, produce growers, makers of kombucha and cheese. Organic grain farmer Thor Oechsner relies on Regional Access for distributing a fair portion of his food grade crops. Oechsner rents storage space in the warehouse for his grain, and pays the company to come to the farm and pick up whatever he wants on hand for his customers. Those customers call Regional Access, which manages a spreadsheet so both buyers and sellers can see the inventory. The farmer handles invoicing. The distributor ships one-ton totes of grain on any of its 12 trucks. Those trucks are also carrying wine, cheese, flour – including Farmer Ground Flour, which Oechsner partly owns – and a lot of products made in the area throughout New York State and the Northeast. Whole animals are on those trucks, too, from slaughterhouses that serve livestock farms. “Our calling card is good clean food,” said Dana Stafford, the very hands on president who’s been with the company for 14 years. About 30-35% of their catalog is local and regional products. 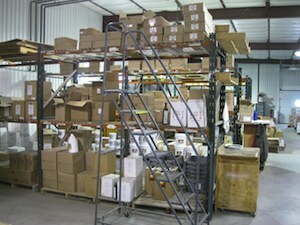 The distributor also carries imports, and a full line of products and ingredients. Gary Redmond, who passed away in 2011, founded the company. “This is his baby. Gary’s vision was steadfast and singular,” said Stafford as forklifts buzzed pallets around the warehouse, prepping for a big shipping day. Redmond was a founding member of a cooperatively run distributor at the forefront of natural foods distribution in the late seventies. After that collapsed, Regional Access began in his garage. An old Agway building housed operations until 2009, when they moved to this steel framed warehouse. The cooler went from 900 square feet to 4500. As the company has grown, they’ve not grown away from their vision. Regional Access’ advocacy for local food works both ends of the equation, advising producers and growers as they build products and markets, and sharing knowledge to educate suppliers as well as customers. This capacity comes from vetting vendors so they know their processes and sources, and can explain them. While Regional Access is well established, they keep trying new things. Over the last few years, they’ve focused on cheese producers, and now this is the largest category of their local products – with Whole Foods on their client list. “Our customers are a diverse bunch,” said Stafford, naming 60% as retail, including major independent stores, mom and pops, coops and natural groceries. Restaurants, food service, caterers, and cafes make up 35% of their business, with a small portion coming from institutional buyers, individuals and buying clubs. Buying clubs can take advantage of Regional Access because of online food distribution services like Wholeshare, which organizes buying groups for local, organic and sustainable products. As the local food environment changes, discussions about distribution among the food and farming groups are a hot topic. “We’re trying to stay involved in conversations, and explore collaborations,” said Stafford. The goal of developing the Northeast as an agricultural entity to feed its population is shared by a lot of people. Stafford and others see the importance of trying to figure out ways to do so collectively, working as allies. However, there’s a fine line between helping develop networks to serve growers and producers, and giving away wisdom – and valuable relationships – built over two decades. While a lot of formal mentorship opportunities have not surfaced, one of Regional Access’s tenets is to provide ‘soft’ business consulting and operational guidance for the food community at large. Many hours are spent discussing and sharing knowledge, and working to find the right solution for the situation at hand—be it as a distributor, a logistics provider or simply connecting the producer or consumer with another, better suited partner. Recently, they have worked with Greenmarket Co., a wholesale distribution division of GrowNYC, and are engaged in conversations with Headwater Foods in Rochester, the Finger Lakes Food Hub as well as the Grow Upstate Food Hub in nearby Madison County. Regional Access has plans to expand. They are looking to open a satellite facility closer to the Metro New York area. Doing so will make working in New York City more efficient. Freeing up trucks upstate will open opportunities for other producers they currently have to turn away.